The parks and fields are white with snow and sometimes I just want to hibernate away these cold months but as the days start get longer I am reminded that snowshoeing is a fun activity that can easily be done after work, in the evening or on the weekends. 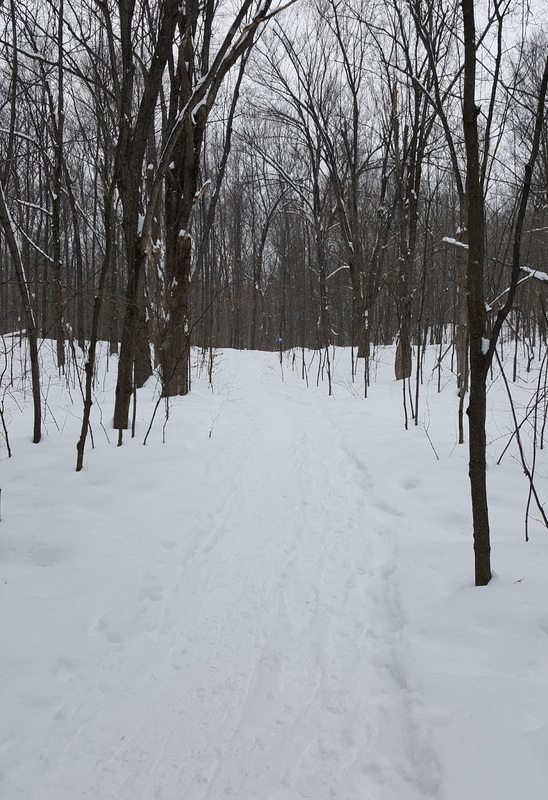 It's a super winter activity that doesn't require as much skill as cross-country skiing and gets you out enjoying the white outdoors close to home - you can easily do it in any park or familiar natural area. Breaking your own path in freshly fallen snow is an activity that can't be beat! And if you get tired, as long as there are dog walkers in the area, you can also follow along in one of their paths that has already been carved in the snow for you! 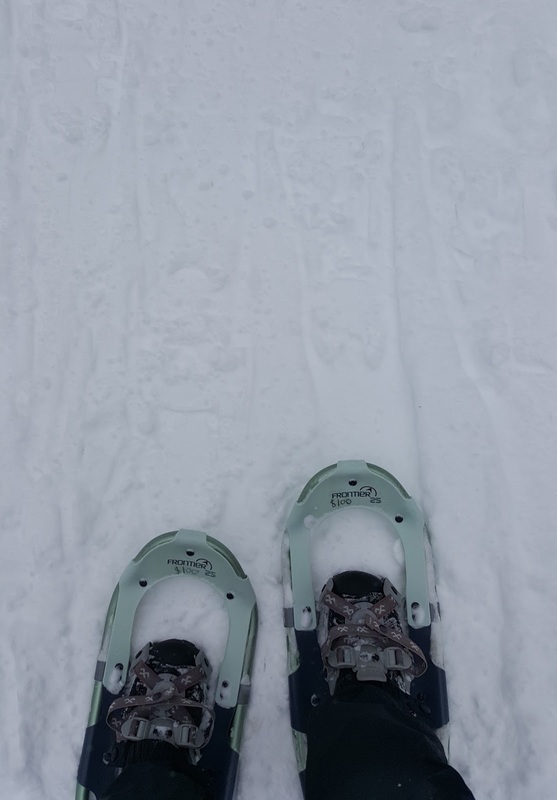 Snow shoeing for the most part is a slower activity so you can bulk up your clothes a bit more than if you were going out to do x-c skiing. Read here for some tips in terms of getting ready for your first outdoor adventure. Approach it as if you were going winter hiking or walking (although there are some groups that look at it as an opportunity for a winter jog on snow! And also, as a slower activity, you can take in your surrounds and check things out at your own pace. 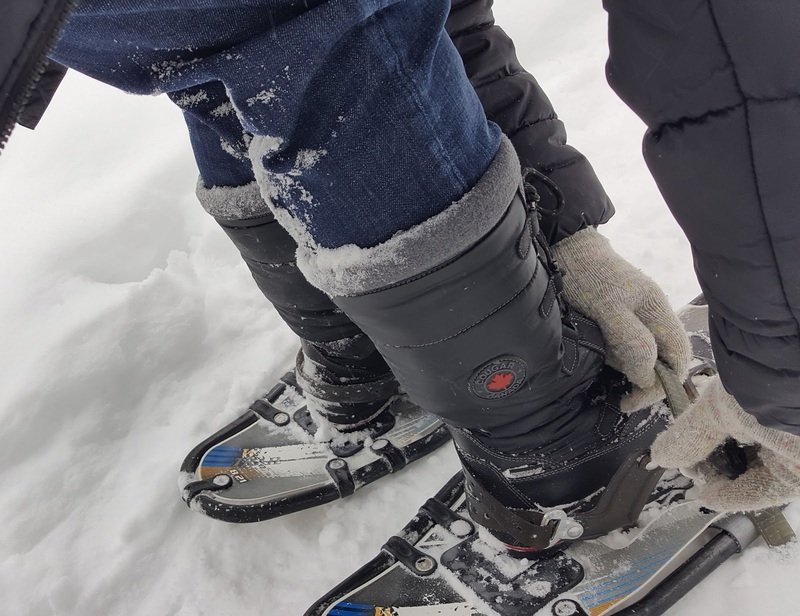 And the other great thing about snowshoeing, if you go a slower pace, is that you can easily enjoy a visit to a coffee shop afterwards to enjoy a warm drink. No sweaty shirts or being out of breath. 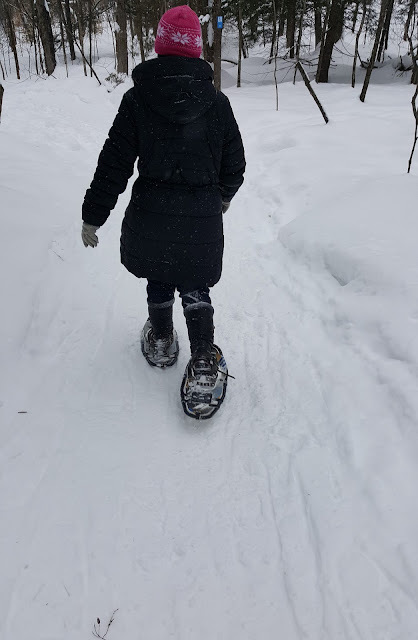 : ) Snowshoes are also easier to tuck away if you do stop at a restaurant or cafe afterwards and if you are enjoying your winter activities through transit trips - they don't take up much room on the bus. Now that the Adawe bridge provides a new connection in this spot, snowshoeing across this new bridge and coming back around on the pedestrian crossing (just South of the highway crossing) provides a nice forty minute outing through parks (on both sides) and a narrow wooded area. Also the Rideau Sports Centre (previously known as the Rideau Tennis Club) has a restaurant that is open to the public. It's open until 11 pm (Mon - Fri) - more details on their website. Where the heck is Moffatt Farm you ask? 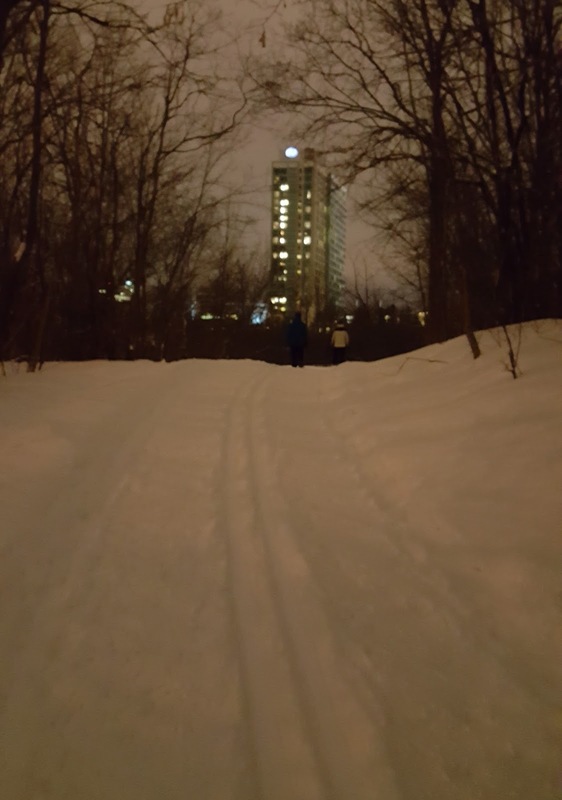 It's the green space across from Mooney's Bay beach and park - on the west side of the Rideau River just before the Hog's Back lock station. It's the quieter side of Mooney's Bay and offers great views across the water and some fun wildlife sightings even in the winter. You can start at Melfa Crescent at one end or you can start at Kochar at the other end. 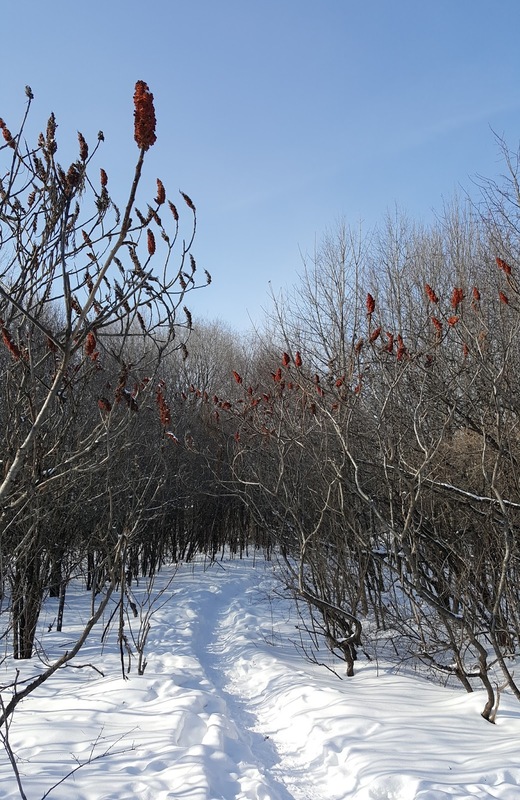 Most of the fun is through the more natural spaces surrounding the park along the river - you can see in many online maps that there are plenty of trails (and you'll find many accessible in the winter even without snowshoes thanks to dog walkers here!) You can spend an afternoon exploring here if you want! We saw diving ducks south of the park where the river narrows (learn about winter ducks here). This is the only location that doesn't offer anything close where you can warm up afterwards, other than a Tim Horton's or McDonalds but they both offer good spots for an inexpensive drink and a rest stop if needed! There's a lot to explore around here - from Parc Moussette on the west side of Val Tetreau all the way around Baie Squaw up to Parc des Portageurs. Here again you may find trails carved along the river by dog walkers and you will also be able to enjoy sunsets (shown here - third photo) along the Quebec side with westerly views across the water towards Aylmer. This is a super spot to explore with varied terrain and lots of twists and turns. Chez Edgar (60 Rue Bégin) WEBSITE LINK - a very popular brunch spot. Café Cinq Sens (399 Alexandre-Taché Blvd) WEBSITE LINK - looks like a simple diner/café where you can get something to eat/drink. They serve Bridgehead coffee. 4. Alta Vista Greenspace "Corridor"
I really like this unique greenspace in the city as it provides such a lovely natural area to the suburban neighbours surrounding it. The main wooded area is north of Grasshopper Hill Park (you can spot this in the aerial view of online maps) but there are also some great open natural spaces south of Kilborne also. Truly this area abounds with greenspace that includes the Kilborne Allotment gardens, Featherstone Park and Lynda Lane Park (where much of the reforestation efforts are going on after many of the dying Ash trees had to be removed). It's also worth taking a peek at Cunningham Park, a hidden city park in the middle of a block of houses - and I'd suggest going back again in spring when the Trilliums are in bloom! Mandy's Cafe (1791 Kilborn) WEBSITE LINK - small and cozy spot that offers all day breakfast and includes gluten-free and vegan options in their bakery. Three Sisters Bakery (2211 Arch St) WEBSITE LINK - I just love this bakery and it recently moved to this larger location so as to have more tables for customers. * Also known as urban light pollution. *** UPDATE 2019: I've just added a new blog post titled "Worth the Trip" that offers six more Ottawa locations for snowshoeing - let us know what your favourite locations are! 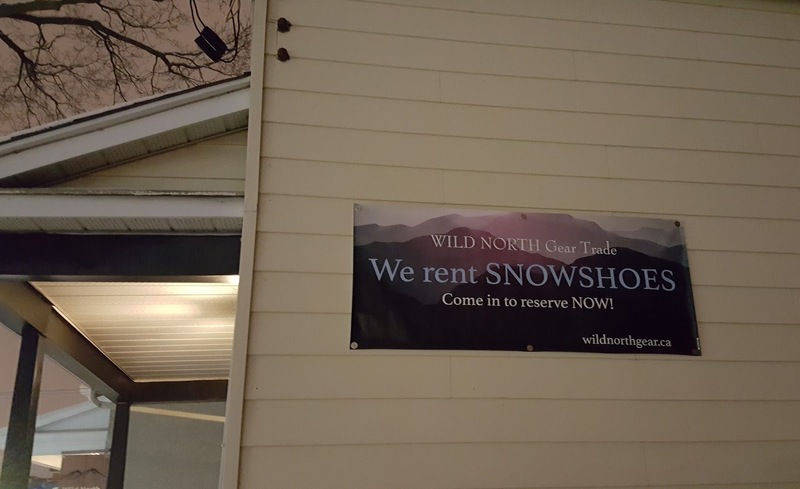 And if you don't have snowshoes - don't despair there are renting options in the city! *Sadly, I just found out that this east end snowshoe rental location is no longer available.